Born at Henderson, New York, June 16, 1838, he moved in childhood to Waukesha, Wisconsin. He graduated from the University of Michigan in 1857 and studied law and began practice in Waukesha. He served in the United States Army during the Civil War (1861-65), as First Lieutenant and Assistant Adjutant General. He began the practice of law in St. Paul, Minnesota, in 1865, and served as a member of the Minnesota Legislature in 1867. He was appointed United States District Attorney for Minnesota, 1868-73 then served as Governor of that state in 1874-75. He was elected to the United States Senate in 1887 and again in 1893 as a Republican. In that body, he served as Chairman, Foreign Relations Committee, 55th Congress. He wrote "The Law In Shakespeare." He was a member of the commission which met in Paris, France, in September 1898 to arrange terms of peace after the Spanish-American War. He died at St. Paul, Minnesota, on November 27, 1900 and was buried in Section 2 of Arlington National Cemetery. His wife, Anna Agnew Doll Davis (the subsequent wife of Hunter Doll) is buried with him. Senator from Minnesota; born in Henderson, Jefferson County, N.Y., June 16, 1838; moved with his parents to Waukesha, Wis.; attended the public schools, Carroll College in Waukesha; graduated from the University of Michigan at Ann Arbor in 1857; studied law; was admitted to the bar in 1859 and commenced practice in Waukesha; during the Civil War served as first lieutenant in the Twenty-eighth Regiment, Wisconsin Volunteer Infantry, in 1861 and 1862; assistant adjutant general 1862-1864; moved to St. Paul, Minn., in 1865; member, State house of representatives 1867; United States district attorney 1868-1873; Governor of Minnesota 1874-1875; elected as a Republican to the United States Senate in 1886; reelected in 1892 and again in 1898 and served from March 4, 1887, until his death on November 27, 1900; chairman, Committee on Pensions (Fiftieth through Fifty-second Congresses), Committee on Territories (Fifty-fourth Congress), Committee on Foreign Relations (Fifty-fifth and Fifty-sixth Congresses); member of the commission which met in Paris, France, in September 1898 to arrange terms of peace after the war between the United States and Spain; died in St. Paul, Minn.; interment in Arlington National Cemetery, Fort Myer, Va.
ST. PAUL, Minnesota, November 27, 1900 – United States Senator Cushman Kellogg David, Chairman of the Committee on Foreign Relations of the Senate, died at his home in this city at 9 o’clock this evening after an illness of two months. He had suffered greatly during his sickness and gradually sank away, being unconscious for several hours before death, and, so far is known, suffered no pain. Yesterday, realizing the approach of the end, Mrs. Davis sent for the Venerable T.H.M. Villiers Appleby, Archdeacon of the Protestant Episcopal Diocese of Minnesota and the Rev. Theodore Sedgwick, rector of the Church of St. John the Evangelist. An attempt had been made to secure the attendance of Bishop Whipple, but that venerable prelate was in Florida. Upon arrival of Archdeacon Appleby and Mr. Sedgwick Senator Davis was for a time sufficiently rational to express his grateful appreciation of their ministrations. For more than a week it had been known that the death of Senator Davis was certain to occur within a short time. Although the bulletins issued by Dr. Stone from day to day made no positive statement to this effect, they nevertheless gave the impression that the case was a hopeless one. However, the announcement came as a profound shock to the friends and fellow townsmen of the distinguished citizen, who had been hoping against hope. The Senator’s devoted wife, who has been in constant attendance upon his sick bed, had never lost hope. The Senator, in his moments of lucidity, expresses a strong desire to recover and within the past week told United States District Attorney Evans, who had been admitted to see him, that he was positive that he would soon be well. Indeed, it is believed, that the Senator’s iron will is all that has kept him alive for the past week. The serious kidney affection which developed on November 11 had refused to yield to treatment and his weakened frame was unable to withstand the poisons left in his system by these organs failing to perform their functions. On Sunday, November 18, a serious change for the worse was noted. Previous to that the Senator had been reported as having occasional periods of delirium. On that day these delirious spells became more marked and since then the lucid intervals have become less and less frequent until the Senator was almost constantly out of his mind. In his delirium he raved of his congressional work. He would declare in vigorous phrases fragments of the Nation’s foreign policy. There was of course no coherence – a sentence about the Philippines would be followed by a comment upon the Monroe Doctrine or a suggestion of an impending war with Spain. But always, in his diseased mind, his patriotic and official duties were with him. There were many callers at the Davis home, but no one was admitted to the sickroom. Two trained nurses were in attendance, relieving each other after short watches. By the Senator sat his wife, who, despite the doctor’s order that she go to rest, refused to leave the bedside. Her vigil had been a long and trying one, but she has borne the ordeal bravely, and if wifely devotion could have saved the dying man he would have been saved. Even in his delirium the Senator was quick to notice her absence from his side, and would toss feverishly about until again quieted by her presence. When rational he assured her that he would owe his recovery, which he never seemed to doubt, to her unwavering cheerfulness and encouragement. Second only to Mrs. Davis in devoted attendance has been the Senator’s aged father. Although past eighty-five years of age, the elder Mr. Davis has borne the terrible strain with great fortitude and has watched over the sickbed of his distinguished son with tender solicitude. The Senator’s mother has herself been very feeble as of late, and she has not realized her son’s condition. Mrs. Morford and Mrs. Bartlett Tripp, the Senator’s sisters, have been staying at the house since the serious nature of the disease has been known, and have relieved Mrs. Davis of the household cares and have received all callers. After his return from the Maine campaign in September, Senator Davis was troubled by twinges of pain in one of his feet, to which he paid little attention, thinking it was due to some neuralgic condition which would soon pass. He began an active campaign in this State, speaking at Duluth and Alexandria. During the latter speech he suffered so greatly that he could not wear his shoe. He returned home at once and was ordered to bed by his physician. A few days later an operation was performed, but he failed to improve and a consultation of physicians was called. An operation on October 14 was immediately beneficial and a further operation was performed October 24. It was at first believed the case was one of blood poisoning caused by infection through a slight abrasion of his foot from the dye of a black stocking and the operations drew off the accumulation of pus. His condition improved steadily until November 4, when he grew worse and Dr. J. B. Murphy, the Chicago specialist, was sent for, a consultation being held the next day. At that time a slight gangrenous condition was discovered and an operation was found necessary, removing a portion of one toe. The wound healed well and the physicians were hopeful of the outcome. However, on November 11 kidney trouble became apparent, both nephritis and diabetes, complicating the case and making his condition more critical. Another consultation with Dr. Murphy was held on November 13, confirming the previous opinion and settling the presence of the kidney trouble. Dr. Murphy had been sanguine of the Senator’s recovery up to this time, but upon the discovery of the fresh complications, he privately expressed the opinion that the case was hopeless. Since then the patient has steadily grown worse. While some days he showed slight improvement and buoyed up the sinking hopes of the family and friends, the disease made constant progress and soon it became only a question of days or hours until death ensued. Throughout the last week of his illness the Senator suffered little pain from his injured foot, which was healing nicely. His strength was kept up with stimulants, but the failure of the kidneys to act left his system impregnated with poison which in his enfeebled condition he was unable to withstand. It became daily more difficult to induce him to take nourishment and stimulants and his strength gradually ebbed away. His delirium lasted nearly a week and this morning he sank into unconsciousness, which lasted until death brought him relief. Grouped about the deathbed were Senator Davis’ immediate family, his devoted wife, his aged father and his two sisters, Mrs. Morford and Mrs. Bartlett Tripp. His law partner, C. A. Severance, and his wife were also present, as well as the doctors and nurses. The family had been prepared for the end since the first sinking spell, which occurred last Friday night, and all have been where they could be summoned at a movement’s notice. Death came almost imperceptibly, the closing scene being marked with but little incident. Mrs. Davis is bearing up bravely and despite the strain of the long weeks of weary watching at the sick bed, withstood the shock of parting with fortitude. The Senator’s aged father is greatly prostrated over his son’s death, as are also his sisters. The Senator’s mother does not know of the death. Senator Frye has been notified of the Senator’s death and his wishes with reference to the funeral arrangements will be complied with. Governor Lind said tonight that all the State buildings will be closed tomorrow and flags displayed at half-mast out of respect to the Senator’s memory, and that the customary period of mourning will be observed. After consulting with the Senator’s family tomorrow the Governor will very probably issue a proclamation for the observance of such memorial service as may be determined upon. ST. PAUL, Minnesota, December 1, 1900 – With the simplest of ceremonies the body of Cushman Kellogg Davis was placed in a receiving vault today in Oakland Cemetery. Owing to the advanced of the dead statesman’s parents, the services, conducted by the Rev. T. W. Sedgwick, were held at the family residence in Farrington Avenue. Here were gathered prominent men from all parts of the country; nearly every member of the Minnesota legislature; all state and city officials; committees from the United States Senate and House of Representatives and hundreds of citizens from the Twin Cities. At the conclusion of the services, the procession formed and followed the hearse over the snow-covered ground to Oakland Cemetery where, after reading of the committal service by Dr. Andrews, the casket was lowered into a receiving vault in the little chapel designed for temporary burial. The body will be interred later. Magnificent tributes of flowers filled the parlors of the Davis home. President and Mrs. McKinley sent a beautiful wreath. An immense wreath of chrysanthemums overlaid with white roses and orchids was the token from the United States Senate, while quantities of American Beauty roses came from members of the House of Representatives, the State Assembly and the Bar Association of Minnesota. ST. PAUL, Minnesota, December 12, 1900 – The will of Cushman K. Davis, who died November 27, was filed for probate today by Mrs. Anna M. Davis, the widow. The will, which is very concise and made during the Senator’s last illness, leaves all his estate to Mrs. Davis and names the St. Paul Trust Company as executor. The estate is valued at $25,000 in person and $40,000 in real property. WASHINGTON, July 29, 1903 – Mrs. Annie Agnew Davis, the widow of Senator Cushman K. Davis of Minnesota, was married here this noon to Hunter Doll of Nashville, Tennessee. The announcement was a complete surprise to official and social friends of the bride. Mrs. Davis was a devoted helpmate to the distinguished Minnesota Senator and assisted him diligently in much of his professional and political work. She was born in Minnesota and from early childhood was regarded as a remarkable beauty. She became the wife of Governor Davis after he had served as Governor of the State and three times witnessed his election to the Senate and shared intimately in his prominence socially in Washington. She was in Alaska when he was named by President McKinley to serve as one of the Commissioners to represent the United States in negotiating the treaty with Spain and as soon as word of the appointment reached her hurried to New York, arriving there within half an hour of the sailing of the steamship. Reaching Paris with a single dress and baggage limited to the contents of a handbag, Mrs. Davis enjoyed a social success rarely enjoyed by any American woman abroad. Her husband’s ability as a international lawyer made his service on the commission of inestimable value to his country and the two were feted and honored wherever they went. While on this sojourn abroad, Mrs. Davis made the acquaintance of the ex-Empress Eugenie. Since the death of the Senator Mrs. Davis has made her home in Washington. 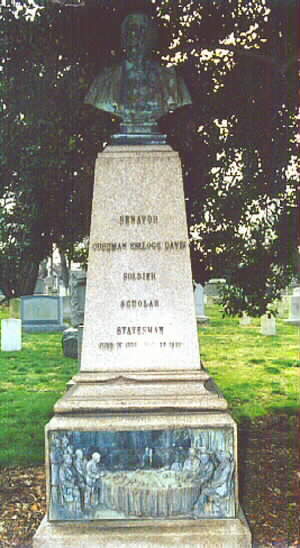 The remains of Senator Davis were at first buried in St. Paul but owing to differenced between citizens of Minnesota and widow in regard to the monument which it was proposed to erect to his memory, she had his body removed to Arlington, where last Decoration Day a bronze bust of Senator Davis by Chevalier Trentanove was unveiled. Mrs. Davis has been occupied at intervals fro the past two years in preparing Governor Davis’s papers and manuscripts with a view toward publishing a memoir. The acquaintance which led to the marriage today began three months ago. Of Hunter Doll little is known in Washington except that he is a fine looking, athletic young man and that he served through the Spanish was as a volunteer in Cuba. The bride and bridegroom, after a wedding breakfast, set out on a honeymoon in the mountains of Virginia.